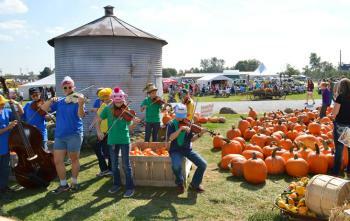 Another fall weekend is just around the corner, and there are plenty of ways to enjoy it right here in Hendricks County. The events you&apos;ll find this weekend offer quite the variety -- fall fun, racing, a ladies night out and a fair for the kiddies that includes an early round of trick-or-treating. Yes, there&apos;s certainly something for everyone in this weekend&apos;s Primer. This awesome fall event drew an impressive crowd this past weekend. But the good news: You haven&apos;t missed the fun. The Heartland Apple Festival at Beasley&apos;s Orchard will reoccur for your enjoyment this Saturday and Sunday from 10 a.m.-6 p.m.
Take in the beautiful scenery and fall activities including wagon rides, pumpkin picking, corn maze, live entertainment and lots of games. Of course, you&apos;ll want to enjoy all the eats and treats - apple cider slushies, orchard fresh apples, sandwiches, burgers and elephant ears. New this year: apple cannons; and they&apos;re quite the hit. Get all the details in my previous post, here. Lucas Oil Raceway in Brownsburg will host the NHRA Fall Classic on Saturday and Sunday. This Division 3 Final will offer racers one last chance to set an NHRA record for the year and provide some exciting racing for spectators. Gates open at 7 a.m.on Saturday and 8 a.m.on Sunday. Perhaps you&apos;ve been looking for a girls night out, or maybe you just want to get a jump start on your holiday décor. Either way, uPaint Pottery Studio, 1820 E. Main St., Plainfield, can fulfill that need from 5-9 p.m. on Friday. uPaint will offer a Ladies Night discount and an excuse to gather all your girlfriends. At uPaint, they do the work for you. No shopping, no supply searches, no clean-up and they will offer a discounted studio fee of $2.50, plus the price of the pottery you select. Prevent Child Abuse Hendricks County will host their annual Kids&apos; Fair on Saturday from 1 4 p.m. at the Hendricks County 4-H Fairgrounds & Conference Complex in Danville. You&apos;ll want to bring the whole family out for this event. Bounce houses, face-painting, food, a DJ, petting zoo, bicycle safety course and an assortment of games make this a fun experience for any child. While they enjoy the activities, parents can gain valuable information including child care resources and mental health information. Let&apos;s not forget, this event will also include safe trick-or-treating and a costume contest. There&apos;s so much fun being offered this weekend. Make the most of it!